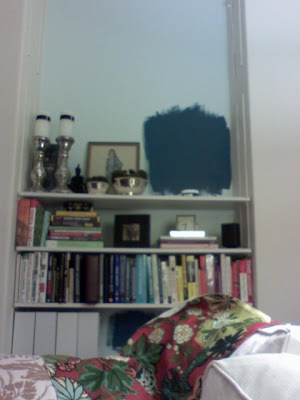 Here is a very blurry camera phone teaser pic of the new paint color I'm doing in the family room. I started last night and its almost done....so stay tuned for the final result! you can paint. not fair. after hearing stories of central ac at a party this weekend and now you, with the paint, I'm moving out there next. Love the color, and it is going to look fabulous with that fabric! YAY! I love when people paint fun colors! Can't wait! Oh I can't wait to see the rest! Such a tease! oh my, I can;t wait to see more! love the dreamy color. Cool color! Can't wait for the finished room. Can't wait to see it when it's finished - great color! i'm not a blue person but i LOVE that color. can't wait to see the reveal.